Malcolm, Noel (1998). Kosovo: A Short History. Basingstoke: Macmillan. ISBN ISBN 0333666127. ^ Baker, George Philip (2002). Justinian: The Last Roman Emperor. Cooper Square Press. ISBN 0815412177. ^ Reuters 1988-07-30, "Yugoslav Leaders Call for Control in Kosovo, Protests Loom"
^ Ruza Petrovic; Marina Blagojevic. 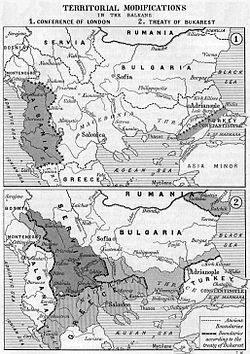 The Migration of Serbs and Montenegrins from Kosovo and Metohija. http://www.rastko.org.rs/kosovo/istorija/kosovo_migrations/index.html. ^ The Economist, June 05, 1999, U.S. Edition, 1041 words, What's next for Slobodan Milošević? ^ Clark, Howard (2000). Civil Resistance in Kosovo. London: Pluto Press. ISBN ISBN 0745315690. ^ Institute for the Protection of the Cultural Monuments of Serbia (1999-6-12). ﻿A large number of cultural monuments in Serbia damaged﻿ (Report). Serbia-info. ^ UNHCR (February 2004). Critical Appraisal of Responsee Mechanisms Operating in Kosovo for Minority Returns. Pristina. pp. 14. ^ U.S. Committee for Refugees (USCR) (April 2000). ﻿Reversal of Fortune: Yugoslavia's Refugees Crisis Since the Ethnic Albanian Return to Kosovo﻿ (Report). pp. p. 2-3. ^ UNHCR. 2002 Annual Statistical Report: Serbia and Montenegro. pp. 9.